Home New York Giants New York Giants: Should The Giants Trade Up For An Elite Defensive Prospect? New York Giants: Should The Giants Trade Up For An Elite Defensive Prospect? The New York Giants have holes all over their roster after a pitiful 5-11 season. The Giants have come up in plenty of rumors surround trades for quarterbacks. However, a trade not a lot of people have mentioned is one for an elite defensive prospect in the 2019 NFL Draft. Who Might The Giants Target In A Potential Trade? The Giants currently hold the 6th pick in the 2019 NFL Draft. They do have a high pick, but they still are not likely to land one of the top 3 defensive players in the draft class unless a team in front of the Giants does something unexpected. There are 3 truly elite defensive prospects in this year’s NFL Draft. Josh Allen is probably the best 3-4 outside linebacker in this draft class. He was spectacular during his collegiate years at Kentucky. Allen holds Kentucky’s all-time sack record. In his junior season, Allen racked up an impressive 17 sacks and 21.5 tackles for loss. He had a total of 88 tackles and even forced 5 fumbles. Allen was an impact player game in and game out. After an impressive close to his collegiate career, Josh Allen finds himself as a lock to be a top 4 pick in the draft. If the Giants want Josh Allen, they will need to trade into the top 4. 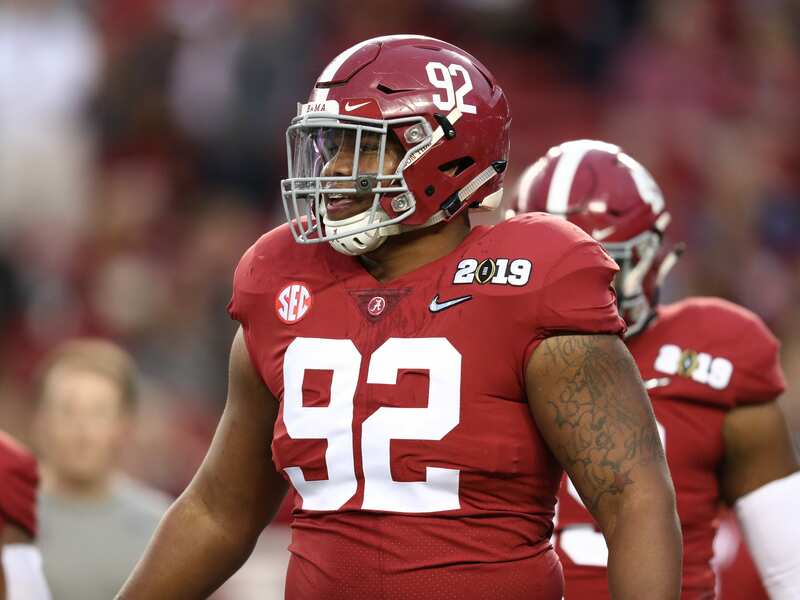 Quinnen Williams is not an edge rusher but he is still an elite, impact defender. Williams is an interior defensive lineman from Alabama. He has been praised as the 2019 Draft’s “can’t-miss” player. Quinnen was nearly unblockable in 2018. He finished the season with 71 tackles, including 19.5 tackles for loss and 8 sacks. Williams was also especially impressive at the 2019 NFL Scouting Combine. His 4.83 40-yard dash caught the attention of scouts throughout the league. Quinnen Williams does not usually make it past the top 4 picks in mock drafts, so the Giants will need to trade up a few spots to land him. Nick Bosa was considered the sure-fire 1st overall pick for quite a while. However, it looks like the Cardinals will be going quarterback with the 1st pick. Bosa will not have to wait long to be drafted though. He seems to be a lock at the 2nd overall pick to the 49ers. Bosa is a tremendous talent. Nick Bosa is the brother of NFL pass-rushing superstar Joey Bosa and has the potential to be better than Joey. In 2017, Bosa totaled 8.5 sacks, 16 tackles for loss, and 66 total pressures. If the Giants want Nick Bosa, they will need to trade up to the 2nd overall pick. Nick Bosa’s hand usage is outstanding. Very advanced for his age. He’s going to end up being an elite prospect. Why Would The Giants Trade Up For A Defender? The Giants seem to be set on waiting as long as they can to get their next quarterback. It does not seem like they will be trying to draft one in the top 10 picks of the 2019 NFL Draft. If that truly is the case, why not go all in on defense and try to get the best player possible? The Giants need an impact player on defense. The 2019 NFL Draft is filled with defensive talent. If the Giants are serious about improving the defensive side of the football, they should consider making a trade into the top 3 picks of the draft. What Would The Giants Need To Trade? The Giants hold the 6th pick and would need to trade all the way up to the 2nd overall pick in order to secure one of these players. The 6th pick is worth 1,600 points and the 2nd pick is worth 2,200, according to the Drafttek NFL Trade Value Chart. This means the Giants would need to create an additional 600 points on top of the 6th pick. The 17th pick is worth 950, so the Giants might be able to trade both of their 1st round picks in order to get one of these players. However, if the Giants do not want to give up the 17th pick, they could still make the trade. If the Giants offered the 6th pick, their 2nd round pick (worth 530 points), and their 3rd round pick (worth 120 points), they will have made up enough points to move up 4 spots and select a game-changing talent. Sure, the Giants could hold their breath and hope one of these players falls in their lap at 6. But if the Giants want to ensure they land a blue-chip prospect, they certainly have the draft capital to trade for one. New York Giants: Is Josh Rosen Even Available For a Trade?